From plastic to metal, stud mounted letters are raised dimensional lettering or logos that have small threaded rods protruding from the back. When stud mounted letters are installed, a paper mounting or installation pattern is used to determine the exact placement of holes that will be made in the surface where the letters will be applied. After the pattern is hung and leveled, a drill is used to make holes where the studs of the letters will be affixed to the exterior or interior surface. Silicone is then used to hold the letters in place once they are mounted to the substrate or backer. Customers Bank choose stud mounted letters for their new branch as a quick way to easily identify their bank. 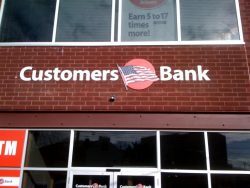 While there are various types of signs to choose from, Customers Bank chose this type because it offered a clean, custom presentation for their name-logo brand identification combination and because they did not have access to a power source in the area above their customer entrance. Read more about the Egan Sign – Customers Bank partnership in our case study here. 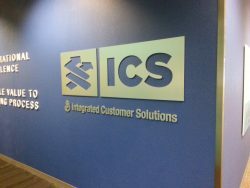 Integrated Customer Solutions gives us a great example of an interior application. They selected stud mounted letters for their office corridors. This is a great way to communicate important branding, mission, vision, and/or values information to both employees and clientele who are visiting your office. These letters are great for company names, logos, and even directional or informational signs, especially when you have limited space to work with or your stroke width or font size is small. Stud mounted letters can be a great fit for your location if you have pre-existing illumination, are working with a limited amount of space, or have a narrow stroke width in your brand’s logo or font. They can be a cost effective signage solution depending on the type of material used. Read more about the industries we serve and the types of signs we create at Egan Sign. Think stud mounted letters are a good solution for your company? Have questions about them? Contact us to start a conversation about how Egan Sign can value engineer a signage solution that meets your individual business needs. It’s interesting to learn that when it comes to picking out lettering to use on a sign for a business, that there are a lot of different options to choose from. One that you mentioned that I like is the stud mounted letters used for interior purposes. I like how you mentioned that this will be useful to help them relay information to their clientele.